Luana Sandoval, a successful singer, songwriter and dancer from Germany, makes her solo concert debut at the Metropolitan Room. Luana performs songs in different languages that best represent her unique voice in the music genres classic, musical theatre and contemporary. She will also perform her originals from her debut EP Love as well as originals from her pianist Nataliya Medvedovskaya. This bright young singer takes us to a musical journey and tells us a bit of her own fascinating story. Luana studied voice and vocal pedagogy at the university of music in Saarbrücken, Germany. During her studies she already sang in the extra chorus of the Theater Trier and participated in the productions of Lakmé, Evita, Carmen and Eugen Onegin. In 2013 she had the chance to sing the part of Maria Valdez in Z-The Musical of Zorro by Robert W. Cabell in Merzig. This was the second European debut performance. Besides her vocal studies she studied oriental dance with Fatima Serin. Since then she has already danced at different oriental events in Germany and Luxembourg. Luana is able to sing different music genres like classic, musical theatre, contemporary and Bulgarian folk singing. She sings in English, Spanish, Italian, French, German, Russian and Bulgarian. Since the age of fourteen she writes her original songs in English, Spanish, French and German. Katie Agresta in musical theatre. With the composer and music producer Mark Roos she recorded her songs Love, Wake Up World, Sin Ti and Melissa. These songs are available on iTunes, Spotify, Google Play, cdbaby and more. 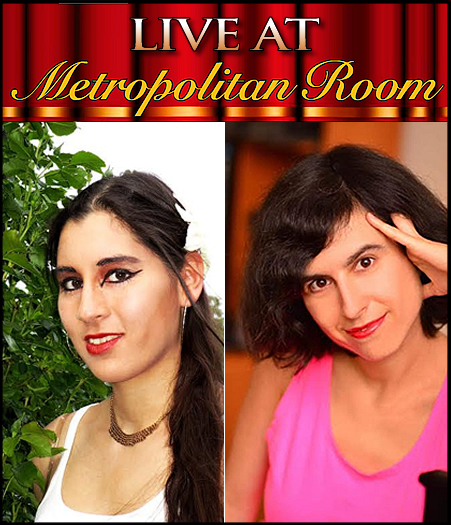 Nataliya Medvedovskaya aka Natasha Meadow, an award-winning composer, concert pianist, songwriter and poet from Russia, makes her solo concert debut at the Metropolitan Room. Natalya accompanies Luana’s versatile repertoire in many ways of expression. Her Russian poems tell us about her childhood in Russia. This extraordinary concert pianist takes us into a soundscape and highlights Luana’s beautiful voice. Nataliya writes music in a wide range of many different genres from classical to pop, Broadway and film/tv. A graduate of the St. Petersburg Conservatory, Russia, with a double major in composition and piano performance, she moved to New York City in 2003. She won FIRST PRIZE at the 1995 International Composers’ Competition of the Gartow Foundation (St. Petersburg, Russia); Second Prize as a composer at the International Competition "Golden Channukia"(Berlin, 2005); "Best Easy Listening Song" Award, "Best Classical Composition", "Best Classical Artist", and "Best Instrumental Artist" from Indie Music Channel in Hollywood, 2015; Honor Award at the 2006 Great American Song Contest; Honorable Mention in the 14th BILLBOARD Song Contest; Honorable Mention in the 11th Unisong International Song Contest; Honorable Mention in the 2007 "Song of the Year" International Song Contest, Directors Award at the 2012 Paramount Group Nashville International Song & Lyric Writing Competition, and an ASCAP Plus Award. She was also a finalist at the "American Songwriter Magazine"s Lyric Writing Contest. In 2004 she composed and recorded three soundtracks for the American Film "I Will Avenge You, Iago!". She was recently chosen to be a part of the Society of Composers and Lyricists’s prestigious New York Film Program for which she wrote her film music demo reel. Natasha has many achievements under her belt as a classical contemporary composer. Her String Quartet # 1 was broadcast by WQXR internationally, performed at Chamber Music America Conference (NY, 2007), Albuquerque Music Festival (NM, 2007), Mohawk Trial Concerts(2006), Summer Mountain Festival (2005), Edinburgh Festival of Art, Music, and Animation (Scotland, 1997), in Yale University, Merkin Hall, and was honorably acclaimed in LA Times, Washington Post, Charleston Daily Mail, and Kalamazoo Gazette. Her cinematic "First Snow" for oboe, bassoon, violin and piano was performed at the "Wall to Wall Behind the Wall" International Festival (Symphony Space, NY, 2010), at An Die Music Series (MD, 2009), and was broadcast by "Classical Music Discovery" radiostation (2015). She recently had a World Premiere of her 2-hour length orchestral BALLET for children based on the "Adventures of Nils" fairytale (Maryland, 2014). As a concert pianist of high regard, Natasha won an Honorable Award at the "Young Virtuosi" International Piano Competition (Czech Republic, 1989). Her CD of Rachmaninoff songs for mezzo-soprano and piano were issued by Mapleshade Records in 2006. She has been playing both her own music and music of other contemporary composers and composers from different eras in Carnegie Hall, Symphony Space, Bargemusic, Steinway Hall, Bechstein Pianos, Austrian Cultural Forum, Liederkranz Concert Hall, Di Menna Center for classical music, The National Opera Center, and other venues. Her performances were favorably reviewed at www.nyconcertreview.com and in New York Stringer Magazine. Natasha recently got into the top 20 on the "Women of Substance" Radio Podcast. Her compositions were featured at DHarmic evolution Podcast, imradio.com, on the Eartaster Sampler 4, and the Noizepunk & Krooner Shows at kalvos.org. Her single, "Inside Out" song has been included into "Hot Tails In The City" Free Lap Dances, Vol.3 Compilation CD. She was the only one who was chosen among hundreds of applicants to get a review of her songs from Radian Records. She performs her songs at various Singer/Songwriter Showcases and Festivals, including Make Music New York Annual Festival, Songsalive Showcases, Independent Music Conference (MA,2011), and Singer/Songwriter Cape May Conference (NJ, 2010). Natasha recently played a show of her pop songs in the world-famous WHISKY A GO-GO in Hollywood, where she was invited to be an opening act for Tracii Guns from Guns N Roses and LA Guns. She is currently composing music for a new Broadway Musical entitled, “Times Square” (script and lyrics by Phillip Langer).